Storage sheds, Garages, Horse Barns, Gazebos, Chicken coops, Dog kennels and Crafts. Shed site preparation, Build on site and delivery. Children of all ages enjoy the fun of playing in our playhouses. Using the highest quality materials, all of our buildings are built to last and will provide many hours of creative fun. You can never have enough storage. 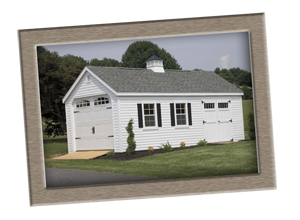 Whether you are housing mowers, cars, boats, tools or your child's outdoor toys, Lancaster PA Shed Builders has a quality built shed or garage custom made for you. Need a place to park your tractor, mowers, bikes, or even your car? Our garages are quality built, solid structures to protect your car, boat, or ATV's from the harsh elements of the weather. We will custom build, one, two,or three car garages! 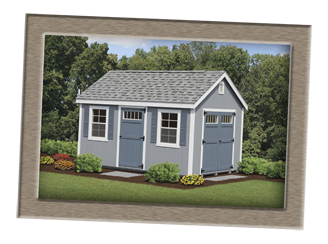 Buy Amish Storage Sheds on this web site or visit our sales lots in Lancaster PA and Conowingo MD. We deliver all along the eastern United States. We will build at your place if needed, see the On Site Garage Tab. Located on a small farm in the peaceful countryside of Southern Lancaster County, Pennsylvania, skilled Amish craftsmen turn out charming, wooden playhouses and custom made storage sheds, garages and small barns. 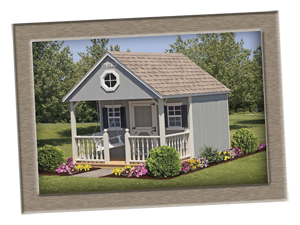 Lancaster PA Shed Builders is proud to offer these fine buildings to you with delivery to your home in Pennsylvania, New Jersey, Maryland, Delaware, New York and Virginia. We use pressure treated floor joists on all our buildings and architectural shingles at no extra charge. In addition to this, we add gable vents and install a product on the roof called Techshield which reduces the heat in the building by 20 – 25%. We do all this at no extra charge. Or are you tired of seeing all the grass your lawn mower drags into your garage? Maybe you need space for that additional car or motorcycle? Or maybe you are just looking for a cute playhouse for your children or grandchildren? We have a solution for all of your outbuilding needs. It all starts with a good floor. We use all treated under frame and then top it off with a lifetime warranty shingle on all buildings! As you browse through our website, you will be sure to find something to fit your needs and enhance the value of your property. If your driveway is too small, or your property does not allow us to get a constructed shed installed, we can build your shed right on site. We look forward to meeting with you again and thank you for choosing our buildings. – Customer Satisfaction is what we strive for! We just wanted to say “thank you”. Our girls are totally in love with the playhouse – its incredible & beautiful. The gentlemen that were here were wonderful too. Please let them know how much we appreciated all their hard work. And many thanks to you for all the answers to questions and helpfulness!! Our girls will be enjoying this beautiful, little playhouse for many years.